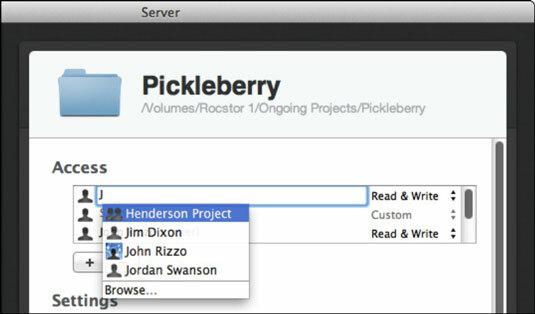 After you create a share point folder or drive in Lion Server, you can use the File Sharing pane in the Server app to add a user or group to give or block user access to the folder. A share point you create has three default entries: Owner, Primary Group, and Everyone. You can’t delete these entries. Everyone means everyone with a user account on the server. This differs from Guest, which means anyone on the network, even people without an account. 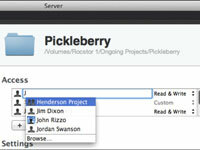 1In the File Sharing pane of the Server app, double-click a folder in the Share Points list. 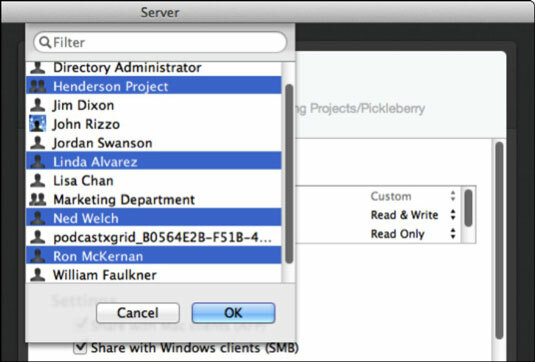 The Server App File Sharing screen appears. This time, you’re working in the Access list. 2To add a user or group, click the Add (+) button; to delete a user or group, select it and click the Delete (-) button. If you click the Add (+) button, a new field appears in the Access list. 3Start typing the name of a user. A drop-down menu appears, listing users and groups that begin with (or are close to) the letters you’ve typed. Included in the list is Browse. Selecting Browse brings up a list of all users and groups. A quicker way to bring up the list of users and groups is to start typing the word browse instead of a name. 4Select a user or group from the drop-down menu or select Browse. 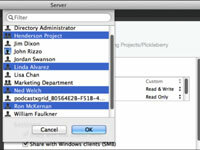 Selecting a name adds the user or group to the Access list, giving them read and write access to the folder. Selecting Browse brings up a new dialog. 5(Optional) If you selected Browse, select a name or add multiple users and groups by cmd-clicking multiple names. Groups are indicated with a two-headed icon. The users and groups you selected now appear in the Access list, with full access (Read & Write permissions). If you don’t need to change the permissions of the users and groups in the list, click the Done button.